A baby must have for all new parents is a baby monitor! Our baby monitor was a life saver with our son and we will definitely be using our awesome new VTech Safe & Sound Full-Color Video and Audio Monitor with our daughter! The VTech Safe & Sound Full-Color Video and Audio Monitor provides a full audio/visual monitoring solution with up to 1,000 feet of range. Other unique features include a split video screen, enabling simultaneous viewing from up to four separate cameras with the purchase of additional cameras, along with infrared night-vision capability for viewing when the room is completely dark. The Safe & Sound Full-Color Video and Audio Monitor also features a two-way intercom system to let the little one hear parents’ voices, polyphonic lullabies to play, a temperature sensor to ensure parents can keep rooms heated or cooled appropriately and vibrating alerts to noise in the baby’s room for notification when the parent unit is attached with the belt clip or in a pocket. Finally, the system offers a six-level LED sound indicator to adjust volume and a rechargeable battery on the parent unit, avoiding the need to continuously stock and replace batteries. Now we have the VTech Safe & Sound Full-Color Video and Audio Monitor and we never have to wonder again! :) Plus, it is great for keeping an eye on our newborn daughter as well! My two favorite features are the infrared night vision and the temperature sensor! I haven't seen too many monitors before where you can see in the dark so I just love that feature! We can use this monitor at all hours of the day..not just during the daylight! The temperature sensor is so great for my daughter's room because it gets really warm in there compared to other rooms in the house. This feature allows us to monitor the temp without going in there and possibly waking her up! 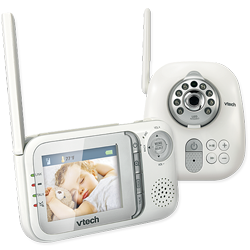 If you want a baby monitor that has it all, I recommend the VTech Safe & Sound Full-Color Video and Audio Monitor! Not only can you see your child at all hours of the day, you can communicate with them, monitor temperature, and play lullabies all from ONE monitor!! Buy It: You can purchase the VTech Safe & Sound Full-Color Video and Audio Monitor for $149.95 on the VTech website.